Museums are not just buildings. They are a series of experiences where humans find sanctuary. They hold in them unfathomable wisdom as they showcase and tell stories about the human kind. Since culture is a fundamental feature that governs the dynamics of humanity in general, museums have evidently shifted from being spaces that display unique and foreign objects to becoming real vessels of intra-cultural communication, strengthening the bonds between all humans. Museums today are veritable centers of learning and discovery. They are windows from where we pear into our own humanity and find ourselves mirrored in a collective image. They are now havens where the human soul heals. 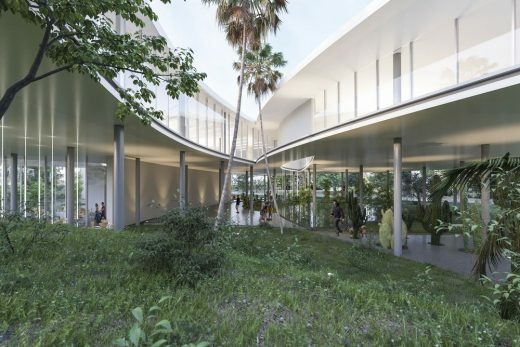 To fulfill its vocation as a place for connecting, gathering and learning, the New Cyprus Museum generously invites the passerby to enter its transparent, shaded and green premises. Mingled in the landscape, the museum library, restaurant and shops activate the ground floor. The pedestrian paths and bike lanes flow naturally in guiding to these activities. Transparency, light wells, shaded areas and courtyards govern the dynamics of the ground floor creating a dialogue between different moments throughout. 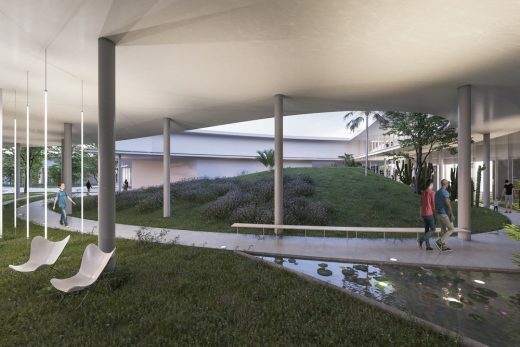 To make this possible, the museum renounces its footprint and lifts itself up on pilotis and creates a spacious, calm and shaded environment intertwined with nature. The pilotis become part of the landscape visually blending with the tree trunks on the gentle landscape. The landscape flows and connects to the neighboring park and captures from it the lush vegetation that stretches out and covers its gentle green hills and valleys. This way, the park and the museum function as a single body connected to the city. The trees and plants come together like an abstract drawing in patterns of colors, sizes and smells that change with the season as fruit trees and flowers blossom and fall in a raw environment. Planes of water punctuate the land creating more diversity within a landscape that hides and reveals secrets as it flows. The museum itself mounts on its pilotis like a tree house keeping a visual scale that blends with its surrounding urban fabric. It swirls its body through the branches of the trees and hovers above them like a cloud with a gentle mothering aura cast around it. The museum space works like misty clouds with natural light flowing from the skylights and glazed walls, similar to Rothko’s square clouds. The focus is on presenting the visitor with intelligent choices and allowing for a freedom of trajectory and proximity. With this configuration, the visitor can easily access the parts of interest. 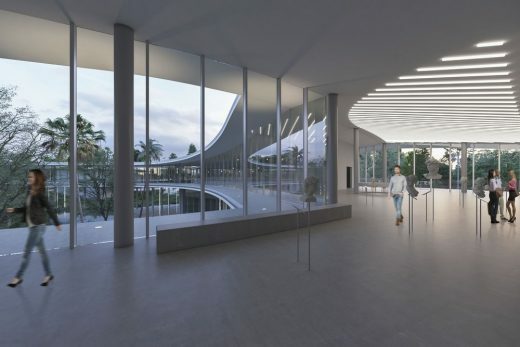 With its generous circulation, the museum invites the visitor to walk along its gently bending paths where they can encounter new objects and new settings. 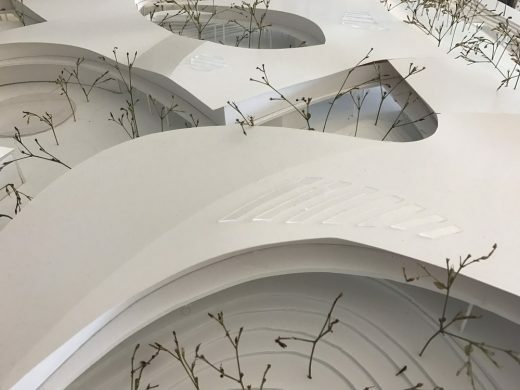 The objects themselves will seem floating in a haze accentuating the cloud like space where people and objects of art drift and interact on a background of green vegetation. This creates a more intimate space between the items and the visitor. Although the museum follows a clear temporal path, the visitor can circulate rather freely heading out for more discoveries. The clusters of objects present their themes through photographic imagery, interactive screens, various types of displays, reconstructions of sites at different scales, holographic representations of missing objects like the Agia Eirini sanctuary’s remaining statues that are currently displayed in Sweden, and exhaustive documentaries to describe themselves as cultural entities within their element. 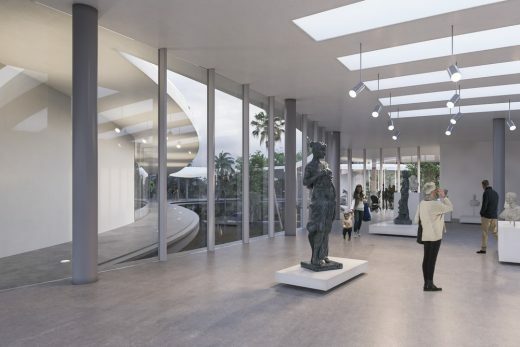 The outline of the museum space encourages the overlapping of views which thins out the indoor space blurring the boundaries between the spaces and the adjacent gardens. The curving walls intensify and expand the spatial experience of the visitors. 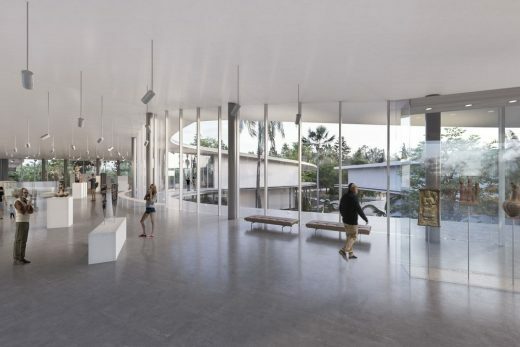 With a more flexible and expandable configuration, the museum imitates the city and breaks from the limiting ambiance of the traditional museum and opts for a more generous and free circulation, encouraging the visitor to return to the museum and spend time in whichever corner of the space they choose. The basement is a spacious safehouse to which the landscape reaches out to create a pleasant environment for the staff throughout the day. A burried buncker full of cultural tearsures carries on its back the light weight steel structure animated by concrete structural walls. Together they produce enough strength to hold the historic weight of the museum. The joint structures makes possible the implimentation of the phasing of the construction. The museum rolls with nature and the surrounding local environment. 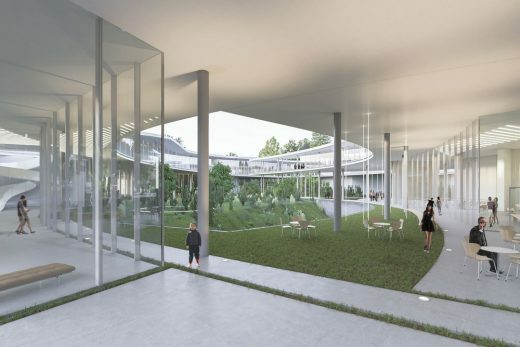 Its sustainability seamlessly integrates with the architecture and engineering, making best use of the natural resources and optimizing the use of passive techniques to reduce energy and water consumption. Sustainability should mostly be based on efficient use of energy supported by the naturally occurring energies that building harnesses, reducing the carbon emissions to the environment. The building balances between the material technology, its durability and its sustainability which impact the carbon footprint of the construction site. Its holistic approach to sustainability will make use of life cycle analysis, taking into consideration embodied and operational energy as well as maintenance and replacing costs. 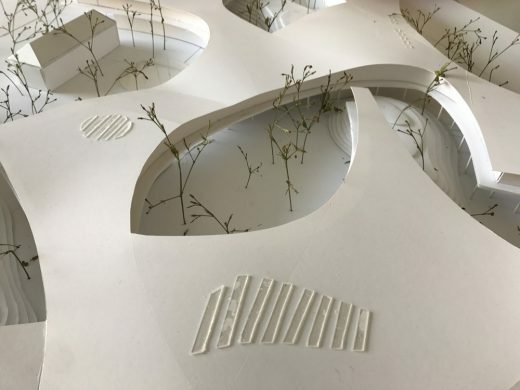 Its construction will envisage to re-using and recycling opportunities for the construction materials leading up into a true cradle-to-cradle design and construction methods and techniques. The museum rolls with nature and the surrounding local environment. Its sustainability seamlessly integrates with the architecture and engineering, making best use of the natural resources and optimizing the use of passive techniques to reduce energy and water consumption. Sustainability should mostly be based on efficient use of energy supported by the naturally occurring energies that building harnesses, reducing the carbon emissions to the environment. The building balances between the material technology, its durability and its sustainability which impact the carbon footprint of the construction site. Its holistic approach to sustainability will make use of life cycle analysis, taking into consideration embodied and operational energy as well as maintenance and replacing costs. 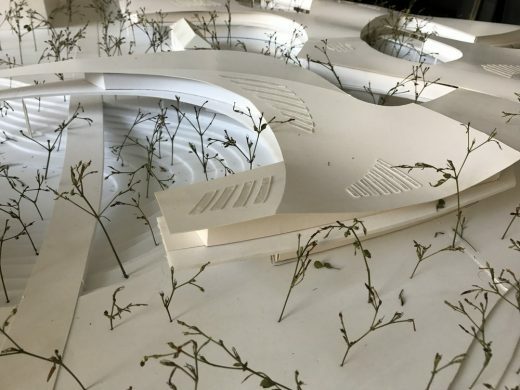 Its construction will envisage to re-using and recycling opportunities for the construction materials leading up into a true cradle-to-cradle design and construction methods and techniques. Green renewable energy is as important as insulation. In Cyprus where the sun is in abundance through most of the year, harnessing solar energy is simply a must. The solar radiation is harnessed to generate electricity and hot water throughout the year. The panels can be installed over time, increasing the harnessing farm over the years. Electrical energy will be used to meet part of the electrical demand of the museum and any energy surplus is shared with the city’s grid instead of being stored in batteries which is so far un-ecofriendly, extremely toxic and under efficient technology. As such, the building aids the power plants providing energy to the city during sunny periods, for the longest part of the year which it regains from the power plants during less sunny periods. The abundance of sun also means the abundance of light throughout the year. 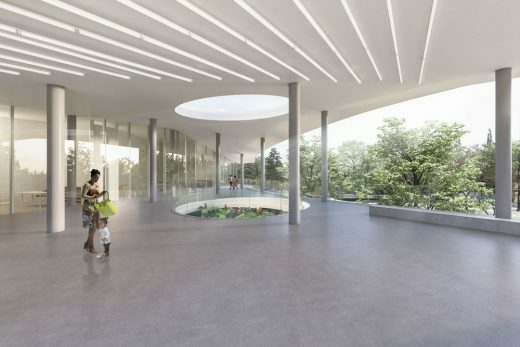 The generous glazing of the museum allows the use of this natural light supporting the lighting system of the museum. The lighting system mostly relies on energy efficient technologies such as LED lights which consume a lot less energy and are more durable than other types of lights. Architecturally, shaded areas, courtyards and fountains are an ancient combination to creating the most pleasant outdoor environments but not only so, they help the cross ventilation of the building itself creating cool currents within the premises of the museum. Paul Kaloustian Studio is a Beirut based Architecture and Design practice working on projects ranging from buildings to interiors. He received his Masters at Harvard Graduate School of Design and worked at Herzog and de Meuron in Basel. Paul has taught at the Boston Architecture Center (2000) and at the American University of Beirut (2009-10). He received the Moukbel Award and the Order of Engineers and Architects Award. 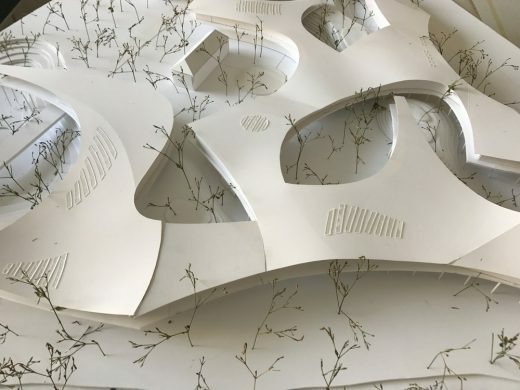 His project, “Smart Center”, currently under construction has been exhibited in the15th Venice Biennale. 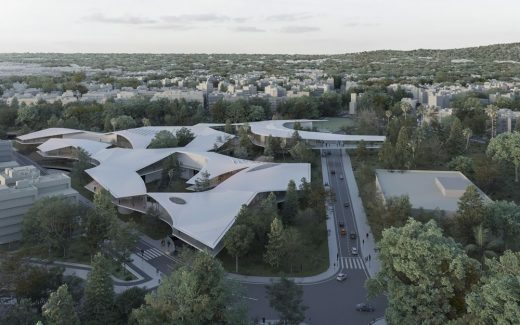 Lately, he has been awarded the 3rd Prize for the international competition, the New Cyprus Museum in Nicosia.